The entire Green Vibrance formula was designed and balanced to help establish and sustain good health. To get 20% discount on Green Vibrance products on our shop, use code GREENSALE2017 at checkout. The ingredients in Green Vibrance were selected to support essential bodily functions without which life cannot be sustained. Cereal grass powders and juices deliver virtually all known nutrients and several uncharacterized conutrients of great value. Organic kale sprouts, organic broccoli sprouts, organic spirulina, chlorella, organic beet juice, organic parsley, organic spinach, organic carrot, green bean, zucchini and Rockweed sea vegetable enrich the nutrient density and diversity of the primary food ingredients in Green Vibrance. Our industry leading dose of 25 billion friendly probiotics, balanced by a rich combination of Bifido- and Lacto- bacilli from 12 strains in each serving of Green Vibrance. These 12 strains of probiotics in Green Vibrance help assure a healthy G.I. tract by supporting colonies of robust, goodintestinal flora. Our industry leading dose of 25 billion friendly probiotics, balanced by a rich combination of Bifido- and Lacto- bacilli from 12 strains in each serving of Green Vibrance. 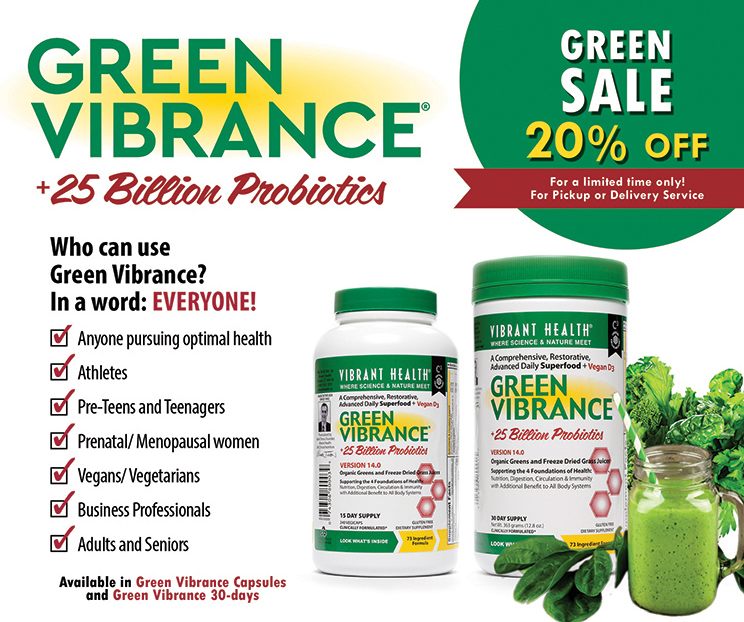 These 12 strains of probiotics in Green Vibrance help assure a healthy G.I. tract by supporting colonies of robust, good intestinal flora. Chlorophyll from green foods in Green Vibrance further supports intestinal health. Apple fiber from our certified organic whole apple powder as well as soluble fiber from acacia gum sunflower lecithin help support elimination of heavy metals, cholesterol and toxins from the intestinal tract before they can be absorbed. Each serving of Green Vibrance delivers a powerful 1,293 mg of herbal antioxidants in addition to beta-carotene, vitamin C, vitamin E and other antioxidants naturally present in the other plant components of the formula. These antioxidants, plus lecithin, soluble fibers, policosanol and other ingredients help support cardiovascular health. * A strong heart and clear arteries are essential to delivering nutrients to and removing waste from every cell in the body. Ginkgo biloba extract, grape seed extract, green tea extract, pomegranate extract, and grape skin extract are all known to improve peripheral circulation. Green Vibrance has always supported good skeletal health. Beginning with version 9.0, Green Vibrance added another key nutrient for bone health: Vitamin D3. The vitamin D3 in Green Vibrance is extracted from an actual plant source, lichen oil.